Cloud 109: The Art of Restoration, McLoughlin, Minton and the Bloody Pulps! 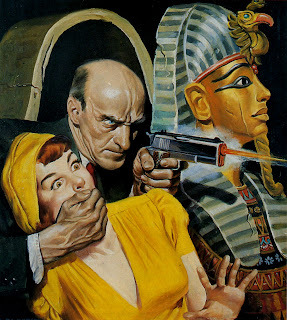 The Art of Restoration, McLoughlin, Minton and the Bloody Pulps! 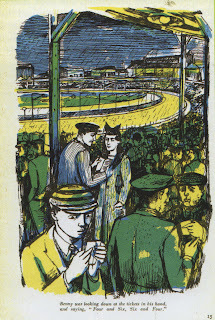 As mentioned earlier on this blog, now that Wulf the Briton is published, Book Palace Books have been back on my case reminding me that there is work to be done completing "The Art of Denis McLoughlin" book which was occupying my "spare time" for the earlier part of last year. So I'm back on the McLoughlin case and last night I was restoring as best I could some scans that Steve Taylor (the man behind the amazing Dan Dare website) had sent me. 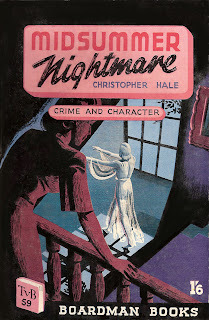 They were scans of some of those fabulous McLoughlin 'Noir" type covers that he hosts on his site. But as is often the way with this kind of exercise, there were problems to be addressed. 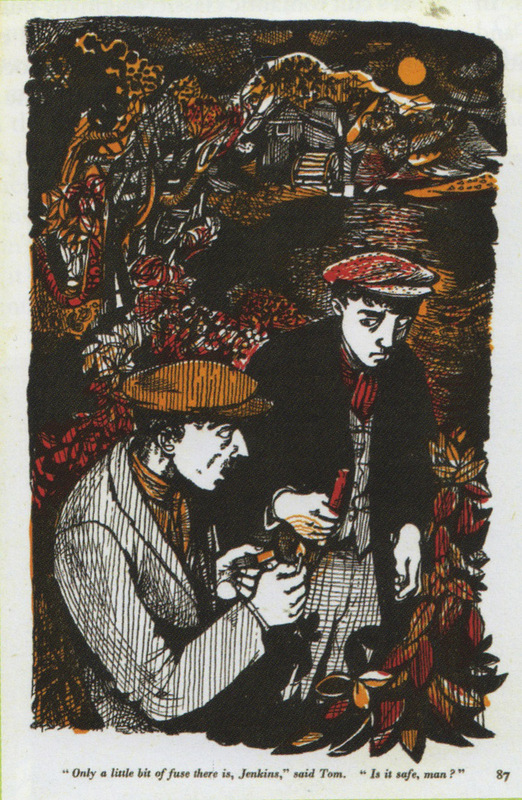 All the shortcomings that needed fixing were the result of a greater problem and that is the absence of about 99% of Denis McLoughlin's original artworks. There are some original McLoughlin artworks in the hands of collectors but they are primarily his Wild West paintings - all the other work, including all those superb hardboiled covers are gone ... as in REAL gone Daddyo! Robert Lesser in his book Pulp Art (excellent and indispensable volume), fulminated about the destruction and disappearance of so much of America's trash art. He should complain! When I see the fantastic biographies of Norman Saunders, Reynold Brown and most recently Hugh Ward and the articles that preceded these lovely books in Dan Zimmer's Illustration magazine, I am constantly amazed at just how much there is still out there. Sadly this is not the case with Denis McLoughlin, which is why reconstructive surgery is being applied to some of the surviving covers. 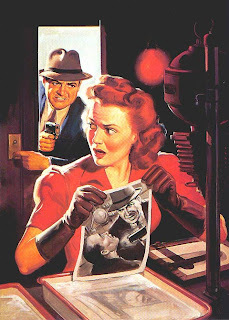 The artist did have up until the time of his self-imposed death, a complete set of perfect proofs of all his 'Noir" covers. But those all disappeared with the contents of his house when his relatives settled his estate. So what we are left with is printed sources and in the case of the paperback covers, these can be particularly problematic. The covers even if they aren't creased, can still be affected by even the slightest hint of damp which means that certain areas of the covers appear sharply in focus, whilst other areas are blurred. With the covers I was working on last night, I discovered "quelle horreur" that the focused areas had nasty jaggedy scanning artifacts, which presented a double jeopardy. It's really like being a picture restorer in the old sense, and even with executing weird manoeuvres like converting from RGB mode to Lab colors and working in each channel separately, you still need a bit of artistic experience, combined with knowledge and study of the techniques employed by the illustrator concerned and the way his work was printed. The processes I am using with these McLoughlin artworks are completely different to those used on the Wulf book. Each new project makes it own demands in regard to getting the degree of digital reconstruction to achieve the right balance between drawing the artist's original intent back out of the murk without completely over-riding his work with intrusive reworking. Do here are two of the covers I was occupied with last night. They are really interesting insofar as they show not only McLoughlin's sheer inventiveness at it's best but also his reference points. 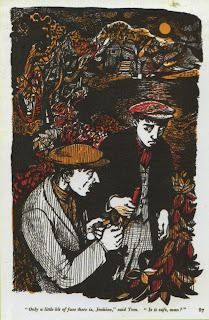 Midsummer Nightmare with it's hen scratching penmanship shows more than a passing homage to that legendary illustrator and Fitzrovian John Minton. In much the same way that McLoughlin's work has suffered at the hands of good old Anglo Saxon snobbery, so to did Minton's. Although it has to be said that while much of McLoughlin's work was destroyed, Minton's illustrations were cherished from the get go, it was Minton's ambition to be welcomed into the world of fine art that were subject to rebuff. As many have since speculated, precisely because he devoted too much time to the "comparatively inferior" world of illustration. McLoughlin's cover for Theodora Du Bois' High Tension on the other hand, shows influences which if not geographically are thematically at least, much closer to home. As a collector and reader of Pulps, he would have been more than aware of the work of such legendary illustrators as Norman Saunders and Rafael De La Soto. With McLoughlin's covers his reference points are as tantalizing as his ever inventive mind. Are those last two covers by De La Soto? They're gorgeous! It's fascinating to see how everybody seems to end up influencing everyone else in any creative community: at one point during the 1970s almost all American comic artists wanted to imitate Jim Steranko's revolutionary fusion of Kirby and Eisner, yet Steranko himself went on to carve out a whole new career as a painter by going even further back to the great pulp artists. There may be nothing new under the sun, but it takes a special talent to make the old stuff sing again for a new generation! I think those Steranko pulp covers are sensational Phil. But for me that's the thing about all great art, it's at it's best when it references the past to create something new and vital for tomorrow. Steranko was amongst the many collectors of Pulp art that provided material for that fabulous Robert Lesser book mentioned above. and there is a really brilliant interview with her in issue 2 of Dan Zimmer's ILLO mag. The bottom illustration is by Rafael De La Soto and like the Saunders is fantastic and was an influence on a truly terrible Denis McLoughlin pulp cover for TVB. Which now I've gone and mentioned it, I suppose I'll have to run at some point. Much as the thought of it grieves me. 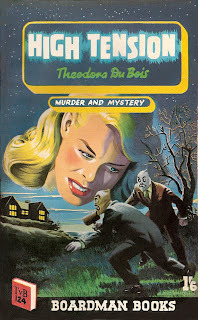 For some reason I generally associate Norman Saunders with the rough impasto style he used for his bubblegum card series such as 'Mars Attacks' and 'Batman' - I tend to forget just how slick his earlier pulp covers were (presumably the example above was in oil?). And then of course there were all those 'Men Only' covers he did for Stan Lee's uncle which used to catch my eye from the upper tiers of Thorpe & Porter's old spinner racks, causing my adolescent self to be appalled and aroused in equal measure - pretending all the while to concentrate on the wholesome Jimmy Olsen comics placed below. Maybe it's just as well that Fredrick Wertham never got to see these fiendish contraptions which slyly beckoned a whole generation of British youth down the four-colour path of moral degradation!